Over the years, carmakers have tinkered with the design of cars to come up with the perfect motor vehicle. This often results in totally bizarre vehicles that would leave the average person more surprised than ever. Back in the 1960s, the US Army launched a project to create an all-terrain vehicle that could transport men and equipment over extreme terrains. The result was the pedipulator, a bizarre four-legged vehicle that walked rather than drove. Further work on the pedipulator led to the creation of a similar walking vehicle called the Cybernetic Anthropomorphous Machine (CAM). A driver inside the CAM controlled the four legs, each of which was 4 meters (12 ft) long. The CAM’s back legs mimicked the movements of the driver’s legs while its front legs mimicked the movement of the driver’s hands. The CAM had no passenger seat or boot. Instead, men and equipment were transported on a bridge attached to two CAMs. The CAM project was canceled after the US Army switched to using helicopters over rough terrain. Nevertheless, the US Army is clearly not done with four-legged walking machines. Along with DARPA, the army is funding a smaller project to build a four-legged, all-terrain robot dog. The Dynasphere was a single-wheeled vehicle invented in 1930 by John Archibald Purves. It was called a Dynasphere because it was built like a sphere with its sides cut off, which made it look like a huge moving tire with a driver. The vehicle was 3 meters (10 ft) wide. The driver sat directly in the middle of the vehicle while the passengers sat in back. The Dynasphere was powered by a 2.5-horsepower engine that ran on gasoline. Later, Purves revealed a much smaller, single-seat version that was powered by electricity. Purves believed that his Dynasphere would compete with cars for the roads, just like today’s motorcycles do. But his idea never caught on. Besides, his Dynasphere was not the first such vehicle. It belongs to a whole class of single-wheeled vehicles called monowheels. The history of monowheels is difficult to trace due to a lack of records, although many are known to have been made before the Dynasphere. In fact, Purves got the idea for the Dynasphere from one of Leonardo da Vinci’s sketches. Constantini motor skates were invented in the early 20th century by M. Constantini. They looked and operated like normal roller skates except that each skate had a 1.5-horsepower engine, battery, fuel tank, and ignition. These small engines were connected to a belt worn around the rider’s waist. The front of the belt contained the ignition to switch the engines on or off. The back of the belt contained a fuel tank that held less than a gallon of fuel. Constantini motor skates never entered mass production, and the invention slowly disappeared from public consciousness. Another man named Mercier also made a motorized roller skate. But only one of Mercier’s skates had an engine. Although little is known about the skates, Mercier claimed that they could travel at approximately 30 kilometers per hour (20 mph) for about 50 kilometers (30 mi) before they ran out of fuel. Henry Ford was so interested in using plants, especially soybeans, in motor vehicle production that he built a laboratory dedicated to soybean research. At first, he used soybeans to make parts for his cars, but then he decided to make an entire car out of soybeans. Although the car did have a steel frame, it was covered with plastic that was made from a mixture of soybeans, wheat, hemp, and other plants. Aside from his attempt to meld the agricultural and automotive industries, Henry Ford was forced to make a car out of soybeans because there was a shortage of metals during World War II. Ford claimed that his soybean car was stronger and sturdier than a regular steel car and could somersault without being destroyed. However, the project was canceled while the second prototype was under construction. Famously called the “Tucker Torpedo,” the Tucker car was made just after World War II by policeman-turned-carmaker Preston Tucker. It had several previously unseen features including a windshield that ejected during an accident, a third headlight that turned in the direction that the car turned, and a sleek design that made it look like the car was moving even when it was parked. Due to the politics of the day, only 51 units of the car were made before production was canceled and the Tucker car company was liquidated. It all began when Preston Tucker leased a production facility from the War Assets Administration. They ordered him to raise a certain amount of capital before a particular date, or they would reclaim the facility from him. Afterward, he began selling stock in his company. But he didn’t raise enough money to begin production, so he began selling accessories for the unmade car. This led to another round of investigations by the SEC and the Department of Justice. Tucker, along with some of his partners, went on trial for fraud and the violation of SEC regulations. The trial focused on the highly unstable Tin Goose prototype while the 50 better vehicles that Tucker had made for the market were deliberately ignored. Although Tucker and his partners were later found innocent, it was too late to save the car and the company. The Schilovski Gyrocar was a six-seater that ran on two wheels: one in the front and the other in the rear, just like a motorcycle. Its six seats were arranged in three rows, and it was powered by either a 16- or 20-horsepower engine. It was able to maintain its balance on two wheels and did not tilt when it turned, when people leaned on it, or when people got on and off. That’s because the Schilovski Gyrocar contained a pair of gyroscopes. Although this car never caught on, it was not the last two-wheeled gyrocar ever made. In 1967, Gyro Transport Systems came up with a single-seater gyrocar called the Gyro-X. But the Gyro-X never made it past the prototype stage because its parent company went bankrupt. While gyrocars are generally slimmer and smaller than normal vehicles, they have never been widely adopted because the gyroscopes needed for stability are expensive and complex to build and maintain. Several propeller-driven cars were made in the 20th century, but none entered mass production due to safety concerns. In the early 1900s, the Helica and Helicron were made in France, the Maybach Experimental in Germany, and the Aerocar in Argentina. The French Helica was quite popular. On the other hand, the Argentine Aerocar had acceleration problems up to 65 kilometers per hour (40 mph). Even so, one US car manufacturer wanted to buy the Aerocar to produce and sell in the US. One major advantage of propeller-driven cars is their lack of gears and brakes. They are also more stable than regular cars and can run on airplane engines. Their major disadvantage is their propellers, which can seriously maim or even kill any unfortunate human or animal that dares to come too close. The Dymaxion Car was a three-wheel, 11-seat flying car made by Buckminster Fuller in 1933. Its name was a combination of the words “dynamic,” “maximum,” and “ion.” The Dymaxion Car was shaped like a zeppelin and had wings that automatically inflated, causing the vehicle to go airborne at full speed. However, it proved highly impractical because it was difficult to control while airborne. The Dymaxion Car was also unstable on the ground, even with the top fin on its third prototype for stability. Initially, investors wanted to fund the vehicle for mass production, but they backed down after a prototype was involved in a deadly accident. Further development of the vehicle ceased, and it currently has a place on Time magazine’s list of worst vehicles ever made. The Pininfarina X (code-named “Pf-X”) was one of the earliest aerodynamic cars ever made. Although Batista “Pinin” Farina often gets credit for designing this car, several other notable people took part in its development. Built on a Fiat 1100 chassis, the Pf-X had a diamond tire arrangement: one tire in front, two in the middle, and one in back. The engine was also attached at the rear where it powered the back wheel, effectively making the car a one-wheel drive. The car reached an average speed of 145 kilometers per hour (90 mph), making it 20 percent faster than the Fiat 1100 chassis on which it was based. Farina met with several carmakers, but none were interested in producing the car for the consumer market. Later, Farina developed the Pininfarina Y, which retained the shape of the X prototype but had a normal four-wheel layout. 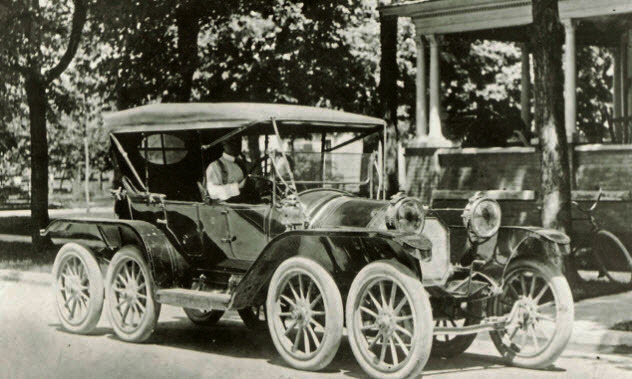 The Overland Autocar was made by Milton Reeves in 1911. It had eight tires: four in front and four in the rear. The car was not entirely new as Reeves had taken a regular car and added the extra wheels. The vehicle had a two-wheel drive with power provided to the second set of wheels in the front. However, all four front wheels were used to make turns. Reeves claimed that his eight-wheel vehicle was better than four-wheel vehicles because the tires did not wear as easily and the vehicle had better stability. The car failed to lure investors, but that did not discourage Reeves. He simply pruned the eight tires to six: two in front and four in back. He called the new car the SextoAuto. But the SextoAuto had nothing new to offer. Like Fuller’s Dymaxion Car, Reeves’s Overland OctoAuto earned a place on Time magazine’s list of 50 worst vehicles ever.